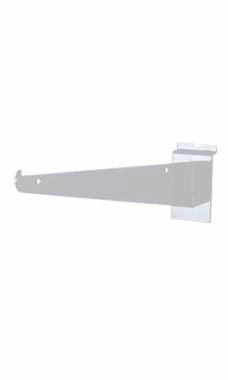 Hold your shelves in place with this Metal Slatwall Shelf Bracket. This bracket comes out 8" and is perfect for holding up smaller, and skinnier shelves. This piece will easily hold up large quantities of items, and will increase the amount of space that you have available on your Slatwall. It comes in a beautiful white finish, and will look great with any combination of Slatwall accessories that you put it with. In stock and available for immediate shipment. quality item, exactly what the picture shows.